Little late this year. 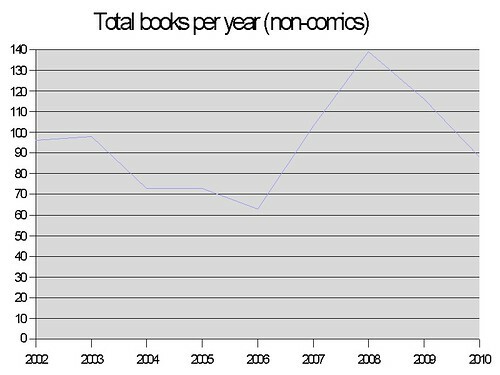 See also 2002, 2003, 2004, 2005, 2006, 2007, 2008, 2009. Popes and the Papacy: A History by Thomas F. X. Noble. Pretty average year in overall terms. 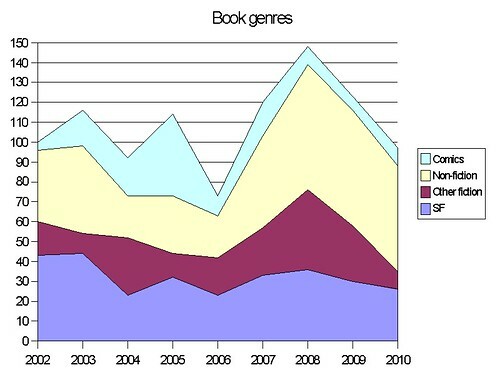 Overall I think I see a trend towards more non-fiction, not sure if that will continue. I've classed it as non-fiction but could easily go in the fiction section. Red Plenty by Francis Spufford is a half-novel, half-fact book about that period in the Soviet Union where they sincerely thought they could overtake the West and create a lavish, consumerist paradise. Easy to read, tragic, and informative. The Time of My Life, Dennis Healey's autobiography fully deserves its reputation as one of the great political biographies: hugely insightful. Love of Shopping is not a gene is a brilliant and comprehensive exposé of the myths of sociobiology. Jim Butcher's Codex Alera series is a fun, gripping fantasy saga, cleverly done with an intriguing magic system. K.J. Parker continues to write sardonically dark, magic-free fantasy with the standalone novels The Company and The Folding Knife. If you've ever thought the problem with Thomas Covenant was that he was too sympathetic a character, you'll like these. Hans Fallada's contemporary story of a tiny, doomed resistance against the Nazis Alone in Berlin is certainly worth reading. Robert Crumb's The Book of Genesis was a surprise: a straight depiction of the powerful founding myths of the Hebrews. Well, that about wraps it up. See you in 2011! - Thomas F. X. Noble. 70 Husi users have viewed this. Although not necessarily read in the past year, all the Butchers and Pratchetts, plus Dragons Egg, Soldier Ask Not, The Revolution Business and Lost in a Good Book. Didn't like the Fforde, The Eyre Affair had been so-so and LIAGB crossed him off my list. There's a sequel to Dragon's Egg by the name of Starquake which isn't too bad, and the rest of the Dorsai universe are worth a read even if of variable quality. Is back now the archive's back, and has got one more Comic on than your second list. I suppose the comic got lost somewhere in the reconstruction.